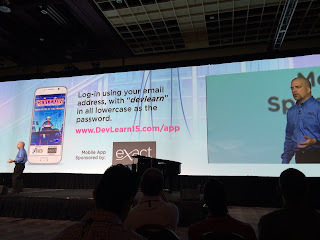 These are my live blogged notes from the opening session at this year's DevLearn, hosted by the eLearning Guild and happening in Las Vegas. Forgive any typos and incoherencies. Disruptive Tech: The unrecognizable New Landscape of Tech and Culture. David Pogue with Yahoo Tech. "My job is to anticipate the dots. And to think about how it will impact us and our lives." There's always been a generation gap, but today that gap has widened. (He shows a picture of his kids and then puts alien heads on their faces). And that gap has come from the phone - which kids use for everything but talking. Inside the iPhone -- audio, video, cameras, speakers, sensors, proximity sensors, 15 different wireless antennas. and in the iPhone 6 a barometer. And so people can write apps to exploit these circuits. The guys sold 1.5 million copies of this app in 6 months. And there's even a google earth connection on this app and you can listen to songs that other people are playing all around the world. Right now. Made possible by in little sensors. 50 billion of these sensors will be embedded in things. And so now every company out there is creating their own version of Internet of Things with apps galore. USB C -- the interchangeable power cords. One cord to rule them all. Google laptops, apple laptops, phones etc. Even better news: Wireless charging. We won't care what cord or jack we have because things will charge through the air. It's the dawn of long range charging. It's one year away. It's an RF single that emanates from an antenna array. The frequency they use is non-penetrating so it won't actually cook your intestines. 12 devices will be able to charge at the same time from the same transmitter. They're going to be building these into refrigerators and TVs and other devices. Uber and ÜberX (these are normal people helping you out). All of this is really disruptive. The taxi drivers have had the business model kicked out from under them. This all rose during the recession, when people needed to make and/or save money. And we're not putting the genie back into the bottle. Wearable Tech. Hot or Not? Google Glass blew it -- $1,500 price tag, no record light - no one knew if you were being recorded and they were quickly banned. Google's working on a new model. But a societal resistance: "the glasshole." Remember the Seque? They were going to change the world, and now the only people who have them are mall cops. Fitness Trackers are catching on. And they track more than steps. There are some to track your posture, your sunlight, you heart rates, your steps, etc. Health tracking hats, bras, forks, earbuds. Any where you can put a sensor, they will do it. We'll be buying 70 million of these this year. And they're becoming more sophisticated -- medical grade analytics. It's not just the technology, but how it affects us. The use of email by people under 25 has dropped 65%. Everything has to be real-time like Twitter, FB messaging. Average age on Twitter is 35. In the new generation, everything has to be on demand. Books, music, learning, movies. College kids on job apps are leaving the home number blank and the email field. They just don't have them. It's generated a new privacy discussion. Google Maps come up with traffic updates (the red, yellow, green roads) by pulling data from all the mobile phones in people's cars. Young people say, cool trade. It's all going too fast. How are you supposed to keep up? William Goldman: "I write every book with the same amount of thought and energy. I don't know when I'm writing them which one will be hits and which will be flops." 80% of broadway shows turn out to be flops. Why are there still terrible movies? 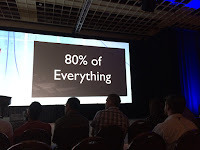 80% of everything is pretty much crap. 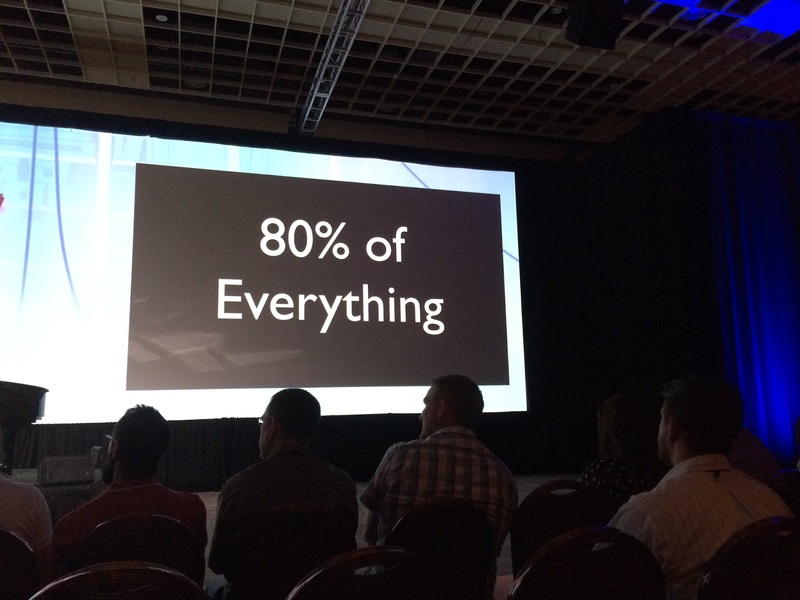 You've got to keep innovating and putting stuff out there to find the 20%. Every new things scares us. Airplanes will make the blood pool in our heads - they don't. Tractors are the work of the devil -- they're not! Cell phones will give us brain cancer - they don't! we discard the bad techs and adopt the good ones. "The pit is always smaller than the plum." David Kelly from the Guild is setting the stage for a great week of learning. The theme this year is "Innovation in the Making." Making innovation happen. It's about dots -- something as simple as a dot. Most of us see the dots that we know – and those are the dots that make up our own personal status quos. Those who innovate, see beyond the dots that make up the status quo. Always be connecting dots. 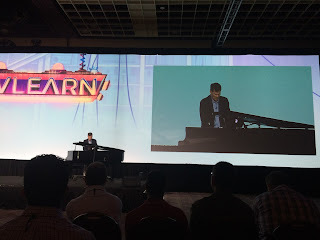 So go forth to DevLearn and connect some dots. See the dots that you don't normally see. The unknown dots are disruptions. If we want to see how technology is changing the way people learn, we need to look at how technology is changing the way we LIVE. The annual migration of the L&D tech crowd to Las Vegas for the eLearning Guild’s fabulous DevLearn conference has begun. In fact, I’m writing and posting this update from somewhere high above the country thanks to free inflight WiFi! The Kineo US team will be there, eager to learn and connect with the expected crowd of over 2,800 of our industry cohorts. So what’s on tap for us this week, aside from attending great keynotes, great sessions, those in-hall conversations where the learning really happens, plus the prowling of the Expo hall to see what’s new? Let's take a look at some of what we'll be up to. 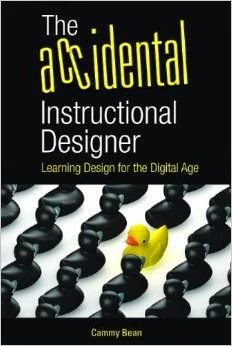 Join me and have a chance to win a copy of my book, The Accidental Instructional Designer! Chances are you didn’t dream of becoming of an eLearning designer when you grew up, did you? Most of the instructional designers in the eLearning business arrived here by accident. So now that you’re here and doing this work, how can you become a more intentional practitioner? In this session we'll talk about four key areas you can focus on in order to become a more well-rounded eLearning designer. You will also discover the ways that you can take your practice to the next level by clearly identifying and honing your instructional designer sweet spot. Finally, this session will provide you with some quick tips for better eLearning design that you can immediately apply to your current and upcoming projects. Grab your coffee and join me for an informal conversation about instructional design and building a career out of what may have been a surprising accident. The conversation will likely build off the ideas in my Wednesday session, but attending that session is definitely not a requirement. If it’s anything like last year’s session, there will be lots of laughing out loud. Don’t miss the fun! For the second year in a row, these two worlds collide as four industry experts use today’s memes to explore the innovative world of learning. The rules of each presentation are simple: Each speaker’s presentation has 20 slides that automatically advance every 20 seconds. 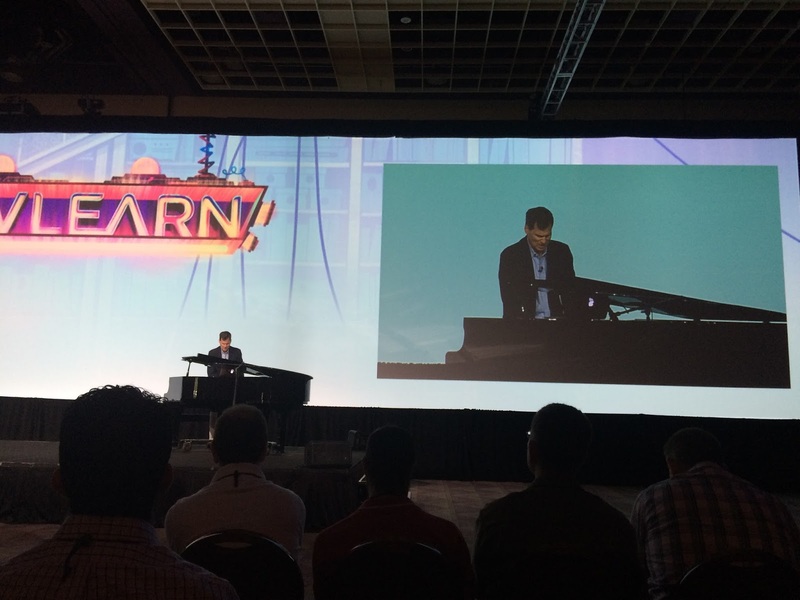 That provides each speaker with six minutes and 40 seconds to share their vision for how learning is being innovated. And there’s one last rule—slides can only use common Internet memes for visuals. We’ll be showing off some of our latest work at DemoFest. And just what is DemoFest? It’s a packed room of more than 80 project teams showing off their work and an exhilarating few hours of getting ideas and inspiration from companies and teams from all over the world. We’ll be showing off a great project with a focus on Totara and Adapt, both open source tools. How does a fast food chain take new managers on a journey from day one to proficiency? How do you provide a structured framework when so much of the learning happens shoulder-to-shoulder on the restaurant floor? Come take a peek at what we’re calling “proficiency journeys.” You’ll see a customized version of Totara, the open source LMS, in action alongside eLearning objects created using the open source Adapt framework. It’s a multi-device, responsive platform complete with checklists and observation forms, eLearning objects, one-on-one mentoring, and assessment of actual on the job performance. Now put that in your milkshake and give it a blend! If you’re at DevLearn this year, I hope it’s fabulous for you. And if you’re enjoying the backchannel from the comfort of home, be sure to follow my blog where I’ll be posting session notes and other tidbits.